International offering rates were drifting lower under the lead of New York during the early part of May, when a sudden and sharp rally in futures ushered in a brief but unsettling period of price volatility. For two or three days, traders were reminded of similar episodes that had occurred in 2008, then (on a far more damaging scale) during the 2010/11 season. The status quo ante was quickly restored and, by the end of the month, offering rates were drifting lower once again. Nonetheless, world prices, as measured by the Cotlook A Index, remained firm by historical comparison. At 88.64 cents per lb, CFR Far East, the average of the Index for the month was well above its long-term average, which is close to 70.00 cents per lb. Firm world prices are consistent with the perception that the volume of cotton still uncommitted from the Northern Hemisphere 2016/17 crops is very limited. That observation now applies also to US cotton, following a sustained period of exceptionally active mill demand. In May, the Department of Agriculture again raised its projection of this season’s US exports. The revised forecast, at 14.5 million bales (480 lbs) would represent the second largest US export total on record, and may yet err on the side of caution. The season’s ending stocks are forecast to decline to 3.2 million bales, the fourth lowest carryover since the turn of the century. Of the major export crops, only Australian and Brazilian are available in volume (principally from trade holdings), prior to the movement of the Northern Hemisphere new crops during the later months of the year. The Forward (2017/18) A Index, which reflects next season’s offering rates, for shipment no earlier than October, continued to show a significant discount (for most of the period around 500/550 cent points) in relation to the current season’s value. The disparity reflects expectations of a strong rise in production next season, as producers react to this season’s firm prices, and the generally favourable yields obtained. During the course of the month, sowing made progress across some major producing regions, for the most part without any major setbacks. On May 10, USDA released its first forecast of US production in 2017/18 since the figure advanced at the February Outlook Conference in Washington. At 19.2 million bales (480 lbs), the Department’s figure was at the upper end of trade expectations, and reflected the prospect of lower than anticipated abandonment in the major West Texas growing region, which includes a significant proportion of dryland cotton. Despite projected exports of fourteen million bales, the Department anticipates that US ending stocks will have risen to five million bales by the end of next season, as illustrated in the accompanying chart. Similarly optimistic production expectations are in evidence in other major producing countries. Sowing is already well advanced in Pakistan and in India’s mainly irrigated Northern Zone, where data confirm a strong rise in area. Farmers in other parts of India have been reassured by the slightly early arrival of the South West Monsoon, which made landfall on the coast of Kerala before the end of the month. Latest indications from the Indian Meteorological Department point to a favourable monsoon, which should allow farmers to realise their intentions to expand cotton plantings. Following two successful marketing campaigns, cotton companies in the African Franc Zone are similarly keen to engineer a rise in cotton area, but there too seasonal rainfall will be a determining factor, both as regards area and eventual yields. Several factors may of course intervene to affect the production outlook, but setbacks during the Northern Hemisphere planting period have so far been minor. As a result, the outlook is for a strong rise in world cotton production in 2017/18. Cotton Outlook’s latest figures point to global output of 24,494,000 tonnes, which would represent an increase approaching eight percent from the estimate for the current campaign. Consumption is expected to follow the recent path of rather sluggish growth, and to rise by 1.8 percent to 24,450,000 tonnes, still some 1.6 million tonnes below the level recorded a decade or so earlier. Globally, next season’s production and consumption are predicted to be broadly in balance. However, for the purpose of market analysis and price discovery, the distinction between the statistical position within and outside China is as important as ever. In late May, Cotton Outlook’s forecasts for 2017/18 pointed to a fall in Chinese stocks of approximately two million tonnes, but a commensurate rise in the rest of the world. Since March of this year, China has been embarked on the latest phase in the process of disposing of the huge stocks accumulated during the three seasons from 2011/12 to 2013/14. By the end of May, this year’s state reserve auctions had resulted in the sale of almost 1.3 million tonnes, which suggests that a reduction in stocks on a par with the 2.6 million tonnes achieved last year is within reach. While ‘destocking’ has been under way, import quotas have been essentially limited to the 894,000 tonnes annually that represent a minimum commitment under the terms of China’s accession to the World Trade Organisation at the turn of the century. Once stocks have been reduced to a level deemed by the government to be ‘manageable’, the expectation is that imports from the world market will rise substantially, since China has an underlying, structural deficit of the order of three million tonnes. The shift to a less austere import policy will have unambiguously bullish implications for world prices, but its timing remains largely a matter for conjecture. No official guidance has been forthcoming in this regard, but a body of trade opinion, informed by the progress of sales at the state reserve auctions, suggests that change may come late next year, or at some point in 2019. Before then, the market must negotiate a season during which, on current indications, an ample supply may exert downward pressure on world prices. Between May 16 and 18, the Better Cotton Initiative held its Global Cotton Conference in Berlin, which marked a new departure for the organisation. The acknowledgement that “with growth comes visibility” provided the motivation behind BCI’s decision to expand its annual meeting to embrace a broader constituency from the cotton industry, including non-BCI members. Some three hundred people attended the conference. During 2015/16, an estimated 2,504,613 tonnes of “Better Cotton” were produced worldwide (up from 1,945,699 tonnes the previous season). The cotton in question was grown by 1,528,537 farmers (1,220,843 in 2014/15) on 3,491,263 hectares (2,599,356). 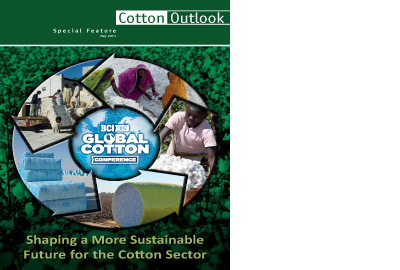 BCI’s ambition is to raise its share of world cotton production from the current 12 percent to 30 percent by 2020. That threshold is considered a ‘tipping point’, at which cotton produced within the BCI framework could be considered to have entered the mainstream.